What is the optimal portfolio allocation to gold? Updated analysis supports an optimal portfolio allocation to gold of 20%. Editor’s note: Flexible Plan Investments, an active money manager and provider of risk-managed investment services, first authored an extensive analysis of the role of gold in investment portfolios in 2013. This white paper has been recently updated and is being presented as a guest commentary in two parts in Proactive Advisor Magazine. Last week’s Part I examined broad issues related to how investing in gold performed in specific market environments. We are pleased to present Part II here, which looks more closely at gold’s performance in classic market regimes and offers broad conclusions on optimal gold allocations for investment portfolios. This analysis suggests an optimal gold allocation of 20%, which produced higher risk-adjusted returns than any other portfolio alternative. It is clear from the examples and analysis presented in Part I that gold can provide favorable returns and act as an important counterbalancing portfolio component under a variety of very specific market and economic conditions that worry investors. But, how does gold perform under different classic economic regimes? “Normal”: Real economic growth rate (GDP) is rising and inflation (CPI) is rising. “Ideal”: Real economic growth rate (GDP) is rising and inflation (CPI) is falling. “Stagflation”: Real economic growth rate (GDP) is falling and inflation (CPI) is rising. “Deflation”: Real economic growth rate (GDP) is falling and inflation (CPI) is falling. their portfolio’s allocation to gold. Figure 10 shows the relative frequency of these different economic regimes over the 45-year time period that was studied. As you can see, the most frequently occurring economic state (81%) was what we call “Normal,” characterized by rising economic growth and rising/moderate inflation. This is to be expected as most central banks around the globe tend to target a 2%–3% annual inflation rate, and governments and private industry obviously attempt to achieve economic growth over time. In contrast, the extreme opposite situation, “Deflation,” fortunately has occurred relatively infrequently (1%). This is the destructive situation where both economic growth and inflation are falling. Japan is a modern case study of the deleterious effects of deflation. (The longest and most notable period of deflation in the U.S. was during the Great Depression, which is outside of the time frame of our study.) Governments generally attempt to avoid this situation at all costs, even if that means printing money and creating temporary excess inflation. “Stagflation” is a situation where inflation is rising and growth is falling. This has occurred roughly 10% of the time. The most notable example of stagflation was during the 1970s when inflation was high, partially due to the energy crisis, and the economy endured some difficult times. Finally, “Ideal” conditions are defined as the period where inflation is falling but economic growth is robust and rising. This regime was present roughly 8% of the time. This is a great environment for business expansion and for investors in many asset classes. The best example in recent U.S. history of an “Ideal” period is the 1990s. Ideal conditions also occurred as recently as 2016–2017. Figures 11 through 14 summarize the performance of our previously referenced asset classes during each of these economic regimes. In the most commonly occurring circumstance of “Normal” economic conditions, gold finished second to equities in terms of average annual return. In “Ideal” conditions, equities provided the best performance. In times of “Stagflation,” gold provided vastly superior returns to any other asset class. “Stagflation” tends to happen slightly more frequently than “Ideal” economic conditions (10% vs. 8%). Gold underperformed equities significantly during “Ideal” conditions. Yet, during periods of “Stagflation,” gold’s 23% annualized gain versus the gain for equities of 2% is certainly a compelling statistic. Deflation was the worst of times for gold, although it did surpass the general commodity asset class. This, once again, reinforces the case for gold as an important portfolio diversifier. Gold provided positive returns under most market conditions (91% of the time in the last 45 years gold was either number one or number two in performance). Gold may not outperform equities in times of normalcy and growth, but it has greatly outperformed equities in times of market stress and inflation scenarios. Because such times have had among the greatest negative returns for traditional equity portfolios, gold can have a significant effect on long-term portfolio volatility. The analysis presented illustrates that gold can provide diversification in several different economic regimes, each of which lies somewhere on the future economic horizon. But how does gold move in relationship to traditional asset classes such as stocks and bonds? As Figure 15 illustrates, gold provided a low correlation to both stocks and bonds and did not move in tandem with traditional asset classes. One of the statistical measures used to capture this relationship is the correlation coefficient, which ranges between 1 and -1. A coefficient of 1 indicates that the assets move in perfect tandem, while -1 indicates that the assets move in an opposite or alternating fashion. Table 1 shows the correlation of gold for a basic set of institutional asset classes. Gold had an average correlation of -0.01, indicating almost no relationship/dependency with other basic asset classes. Gold had the highest correlation to the CRB Futures Index, which is to be expected because this represents exposure to the commodities sector, which includes gold. Clearly gold has been an excellent diversifier for a basket of basic institutional asset classes. The study by Oxford Economics referenced earlier shows the optimal allocation to gold is 5%, assuming 2.2% growth and 2% inflation. Under the conditions where inflation was higher, the optimal allocation was also found to be higher than 5%, and the same was true for conservative investors in a low-growth/low-inflation scenario. In a 2006 study, Richard Michaud, Robert Michaud, and Katharine Pulvermacher of New Frontier Advisors demonstrated that gold was part of the optimal portfolio for investors at all levels of risk-preference tolerances—not just for a balanced investor. Adjusting for uncertainty and seeking the most robust solution, they found that for risk-level tolerances consistent with a balanced investor (risk of around 10% standard deviation), the optimal allocation to gold was found to be above 10% in the base-case scenario using multiple asset classes and historical market data. Figure 16 is from the Michaud et al. study. It shows the optimal portfolio weight in gold and the maximum (upper) and minimum (lower) allocations at different levels of target portfolio risk. *The study used RE statistical analysis to determine the significance of gold in the strategic asset allocations on the Resampled Efficient Frontier (REF). Source: Michaud et al., 2006. Using a more conservative set of assumptions with estimated portfolio inputs, Michaud et al. 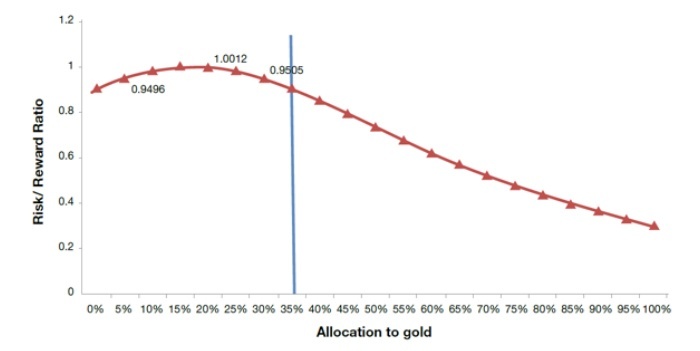 found that the optimal allocation to gold was close to 5% at risk levels consistent with a balanced investor. Figure 17 shows the optimal portfolio weight in gold and the maximum (upper) and minimum (lower) allocations at different levels of target portfolio risk in their conservative case. But, has gold boosted risk-adjusted returns for a more typical portfolio? What has the optimal allocation to gold been for such a portfolio? These are more important questions than finding the optimal allocation across a broad universe of asset classes that are more commonly held in large pension portfolios. As a test of gold’s possible diversifying power, we can use this typical portfolio and add a varying percentage allocation to gold to determine whether we can increase risk-adjusted returns. We will represent stocks in the portfolio with the Vanguard Total Stock Market Index, and for bonds, we will use the 10-year Treasury Total Return Index. 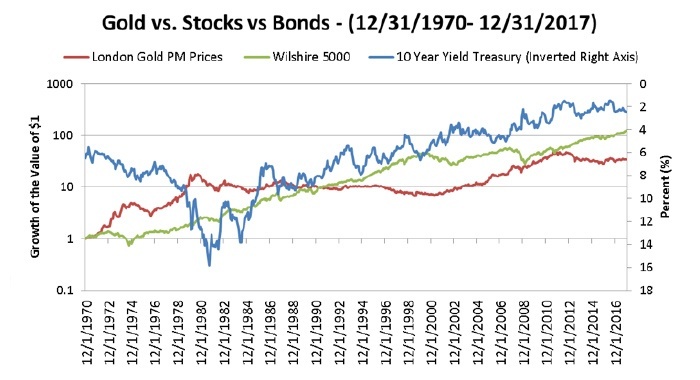 Figure 18 shows the risk-adjusted return ratio (Sharpe) as a function of the allocation to gold from 1973 to the present. A balanced portfolio has a Sharpe ratio of 0.9038 during the period. Therefore, all of the red “dots” left of the vertical center line are portfolios that dominate a balanced portfolio in terms of risk-adjusted returns. In finance parlance, these portfolios are considered to lie on the “efficient frontier.” Table 2 shows a more complete breakdown, providing data points for various levels of allocation to gold and the resulting total portfolio risk-reward ratio. All portfolios with allocations to gold highlighted in green have been superior to a traditional balanced fund in terms of risk-reward ratio. 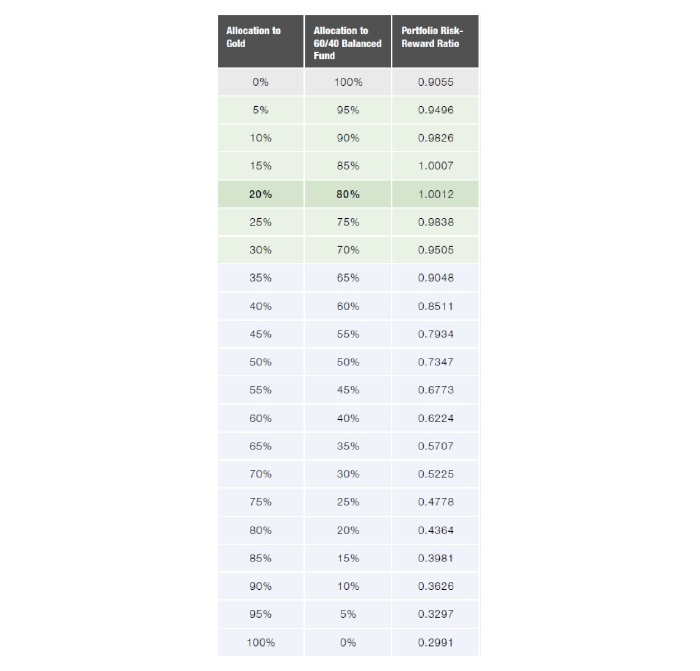 As Table 2 demonstrates, it has been possible to allocate as much as 35% to gold in a portfolio and still have a superior risk-reward ratio to a portfolio that holds only a balanced fund. This also shows that the optimal allocation from a risk-reward standpoint has been to allocate 20% to gold and 80% to a balanced portfolio. This is 5% lower than was optimal when we first released this paper in 2013, reflecting the fact that over the past four years the optimal level of gold for such a portfolio would have been lower—falling from 25% to 20%. Diversification has become relatively less important than returns in creating the best risk-adjusted portfolio, but it is still substantial. Table 3 compares this “optimal portfolio” with both gold and a balanced portfolio. Our study demonstrates that adding gold to a typical balanced portfolio has been beneficial across a wide range of allocations in terms of boosting risk-adjusted returns. Over the 45 years studied, the optimal allocation in a balanced portfolio has actually been 20% to gold and 80% to a balanced portfolio, representing an end result of roughly 50% stocks, 30% bonds, and 20% gold. In fact, investors could have allocated as much as 35% to gold based on historical analysis and still placed higher on the frontier of efficient portfolios than a purely balanced fund. Both the optimal (20%) and upper range of efficient portfolios (35%) may seem to include a fairly high percentage of gold compared to the 5% rule-of-thumb allocation to which a large number of financial advisors seem to subscribe. But there is a precedent. The “permanent portfolio” by Harry Browne recommends an equal weighting (25%) across stocks, bonds, cash, and gold as being optimal across different economic regimes. We believe the evidence presented in this white paper strongly suggests that the currently prevailing “conventional wisdom” greatly understates the potential role of gold in portfolios for a typical investor over the long term. Based on our 45-year study, it appears most investors are likely underinvested in a full range of investment alternatives, and specifically in gold as a long-term asset class. Research suggests that an allocation to gold over the long term can be as high as 35%, while still providing better risk-adjusted returns in various market environments as compared to the traditional “60/40 balanced” investment portfolio. For investors, who have understandably grown more concerned about capital preservation in times of macroeconomic risk, but who are still looking for optimized returns, gold should be strongly considered as a key portfolio element. Over the long term, gold offers the broad benefits of (a) ongoing marketplace demand in the face of limited supply; (b) historic protection from extreme market events, high periods of inflation, and devalued currencies; (c) a time-tested component of portfolio diversification; and (d) liquidity and versatility in terms of the many forms of ownership possible for an investor. This article presents an excerpt of the white paper “The Role of Gold in Investment Portfolios.” The complete paper—including a list of source data—can be found here. Past performance does not guarantee future results. Inherent in any investment is the potential for loss as well as profit. A list of all recommendations made within the immediately preceding 12 months is available upon written request. This white paper is provided for information purposes only and should not be used or construed as an indicator of future performance, an offer to sell, a solicitation of an offer to buy, or a recommendation for any security. Flexible Plan Investments, Ltd., cannot guarantee the suitability or potential value of any particular investment. Information and data set forth herein have been obtained from sources believed to be reliable, but that cannot be guaranteed. Before investing, please read and understand Flexible Plan Investments, Ltd., ADV Part 2A and Part 2A Appendix 1.